Do you love spending time nestled up in nature’s bosom? Or are you the kind of person who spends much of your time at the beach? Well, it is time to crank up your comfort knob and get yourself a hammock and not just any hammock, but the absolutely stellar Guide Gear Portable Folding Hammock. Why, you ask? Unlike normal hammocks which need to be strapped around branches or tree trunks, this hammock exhibits versatility like no other. It comes with a detachable and foldable stand which makes it usable on any type of flat ground. On the other hand, if you do not want to carry the stand with you, you can easily unhook the hammock and tie it around the branches of trees. Moreover, we believe that at its current price, this stellar hammock is a steal! In this article, we will provide a comprehensive review of the Guide Gear Portable Folding Hammock and find out why this could soon be your favorite companion on the next trip to the beach or into the wild. So read on, to find out everything you need to know about this brilliant and highly versatile hammock. Thinking Guide Gear? … Get it on sale here. Comfort: We believe its average score of 3.8 after over 1,000 customer ratings in Amazon.com does not do justice to the capabilities of this stellar portable hammock. Most of the negativity is centered around the relatively flat hammock cloth. However, we did not have the slightest problem with it. Granted that your weight is below 200 lbs, you will be more than comfortable in this hammock. Finally, the incredibly low pricing of the Guide Gear Portable Folding Hammock is what seals the deal for us. There is no other portable hammock available in the same ballpark as this product. If you are in the market for a highly versatile portable hammock, this is as good as it gets. So what are you waiting for? We suggest you go right ahead and purchase this brilliant hammock. Whether you are lying down inside a sleeping bag in the midst of nature or relaxing on a foldable chair at the beach, nothing beats the comfort of a hammock. However, the main problem with a normal hammock is that it needs to be tied around branches of trees. That means you will not always find the best spot to relax, especially if you are in a beach environment. The Guide Gear Portable Folding Hammock, on the other hand, does not need to be tethered to trees or poles. Its sturdy and lightweight steel frame allows you to place the hammock on any flat surface. Once you find the best spot on the beach or in the midst of nature, you can easily unfold the sturdy metal structure and set up your hammock in under a minute. When it comes to comfort, this portable hammock surely takes the cake. However, it takes some getting used to. If you jump on the hammock or try sitting around the edges, it is very likely that you will tumble over along with the hammock itself. Once you manage to lie down and stretch your legs, you will never look back. In fact, we believe that after you experience the level of comfort it offers, you will be taking every afternoon nap on this hammock. Unlike normal hammocks, this portable hammock features a supremely comfortable mesh fabric which makes it perfect for hot weather. The breathable mesh fabric does a great job at keeping you cool even on a hot sunny afternoon. 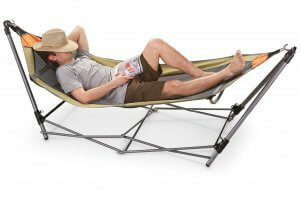 Finally, the structure of this hammock enables you to rock lightly, and that takes its comfort level even further. 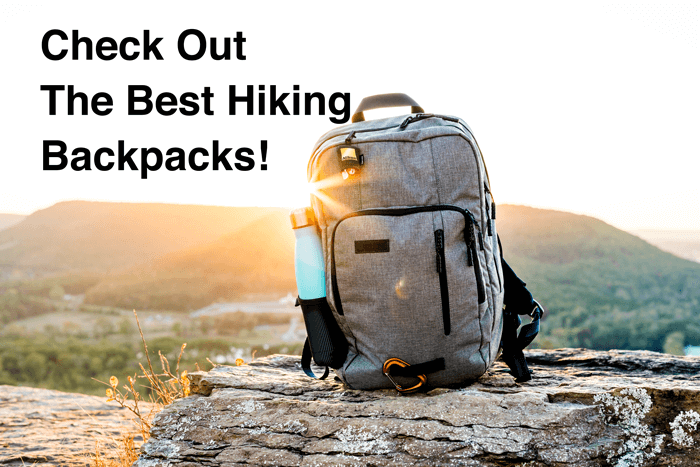 Weight and Portability: You might be misled into thinking that the highly versatile Guide Gear Portable Folding Hammock with its sturdy metal frame will weigh a ton. However, this stellar hammock is truly portable and weighs only 26.45 lbs (12 kg)! That is seriously impressive when you consider its fairly large dimensions of 96 inches X 32 inches X 27 inches (244 cm X 81 cm X 69 cm). The best part about this hammock is its portability. You can easily fold down the metal frame, and stuff the entire hammock in the included backpack style carry bag. This makes it highly convenient for camping or trips to the beach. Moreover, you can also unhook the hammock and leave out the metal frame if you are thinking of packing light. Durability: If you doubt the durability of this product, all you need to do is unwind the accordion frame of this portable hammock, and your skepticism will be put to rest. The accordion metal frame is not only lightweight but also extremely sturdy and manages to inspire a feeling of confidence. According to the Guide Gear company, this portable hammock can support up to 225 lbs (102 kg) of weight. While that is nothing to write home about, we feel that the metal frame is durable enough for supporting more weight. However, the problem lies with the relatively flat hammock cloth. In fact, we believe that if this metal frame is paired up with a different hammock, it will be able to support more weight. Versatility: When it comes to the subject of versatility, the Guide Gear Portable Folding Hammock reigns supreme. It is hard to think of a hammock which is more versatile than this. Not only can you take this hammock into the woods and tether it to the trees, but you can also unfold its metal frame and set it up on a flat surface. Its versatility is what makes this hammock so special. It offers an added level of convenience no other traditional hammock can match. Moreover, once you are done with your relaxation session, you can easily fold up the entire hammock and put it inside the included backpack. The lightweight frame makes it a breeze to carry around. Where do I get the best deal? Get your Guide Gear hammock here! We believe its average score of 3.8 after 1126 customer ratings in Amazon.com does not do justice to the capabilities of this stellar portable hammock. Most of the negativity is centered around the relatively flat hammock cloth. However, we did not have the slightest problem with it. Granted that your weight is below 200 lbs, you will be more than comfortable in this hammock.